A comfortable pole position, several tenths clear from his rivals. Lead from the start, have the opposition on their knees in a matter of a few corners. Seconds clear after one lap. Control the race and your tyres from there. Cover whatever your opponents do. Result never in doubt. A copybook win from the front. Another average Sunday for young Seb then. Yes, Sebastian Vettel took the win in Singapore, and it was a classic dominant performance, the sort trademarked by Ascari, Clark, Senna... and more and more it's becoming synonymous with Seb as well. No one ever got near him - he was 2.5 seconds clear at the end of lap one, and after a mid race safety car period he was no fewer than four seconds clear over the line to start the first racing lap. It was actually the first race this year that Seb has led flag to flag. It really doesn't seem that way. The 2011 drivers' championship isn't quite his yet, but the odds of him not doing so are probably about the same as the moon turning out to be made of cheese. Only Jenson Button can now, mathematically, take the title instead, and only by winning the five remaining rounds and Vettel scoring no points at all. Ain't gonna happen. Sebastian Vettel will be a worthy champion, as will his team. There have been many comments that Vettel dominating races is rather samey (putting it politely), but there's so much to admire in how both Vettel and Red Bull are going about their business right now. Yes, they're benefiting from the genius that is Adrian Newey, but it's not all about him. What we're seeing is a driver and team in perfect unison and absolutely maxmising their considerable potential. The slight waywardness and trodding on their own tail of last year, almost like they then couldn't quite comprehend their own technical advantage, seems from another age. 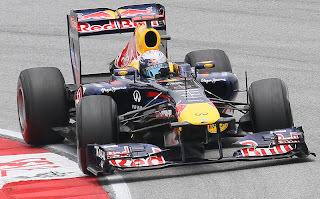 The unreliability of last season has also been reversed and then some, there's been not one mechanical retirement this year for either Red Bull car, or even the threatening of one (I can't even think of them having to manage a reliability problem in a race in 2011). Further, Red Bull's pit stops are the best in the business (and that's a fact - look at the times) and their strategies are as sharp as a tack. And it's up to their opponents to match them. They're the ones that should be getting our disdain. As mentioned, only Jenson can now stop Seb taking the 2011 title, and he put in a worthy effort in pedaling hard to keep up and provide Seb's one genuine, if vague, threat today. He was eventually rewarded with second place, continuing his recent good form and placing him second in the table ahead of Alonso (the battle for second in the championship remains close). And if it was classic Seb today then it was also classic Button in many ways. Staying out of trouble in the early corners, getting yourself into a good position (in this case, second) and be fast and consistent from there. He even got close enough to Seb in the late laps to threaten to make things interesting, before his charge was halted by two squabbling Williams ahead of him, not wanting to be lapped. Seb probably had it all under control, but Jenson's refusal to accept defeat and leave things to chance was indeed impressive. Webber completed the podium, and his race again reflected so many of his this season. Once again he lost positions off the line, from second on the grid he was fourth at the first corner. His race was compromised by having to spend half the race behind Alonso, before leapfrogging him with a good opportunistic move in the first lap after the safety car period (though he was assisted by Jaime Alguersuari ahead not making much effort to get out of the way...). He threatened Button in second for a while, but fell away at the end to finish third, almost half a minute behind his team mate - even after a mid-race safety car negated most of the gap. Call me Mr Hyper-Critical but you'd think he should be finishing a bit closer behind than that. Fernando Alonso was gritty as always today in a rear guard action, eventually rewarded with fourth place. He had some brake cooling issues apparently (not surprising at this track, the toughest on brakes all season), but Ferrari's mid-season competitiveness has almost completely evaporated, and they had no rain or medium/hard tyres to blame this time. Further, their promised race pace, from superior tyre management, was never on show today. If anything, they ate through their tyres more quickly than the cars around them (Alonso was the first of the front runners to pit). They're lucky to have Alonso who you suspect is getting results from that car that it doesn't really deserve. And kudos to Paul di Resta, who finished sixth, his best ever F1 finish. He went for a contrary strategy, starting on the prime tyres, and made it work beautifully, being error-free and consistent. It also continues Force India's recent trend of outperforming Mercedes, to be best of the rest, at the higher downforce tracks. Elsewhere, Sergio Perez continued to have the upper hand in the Sauber camp, he came in tenth with team mate Kobayashi down in fourteenth. After his cack-handed qualifying crash, Kobayashi seems to be slightly off the boil in the second half of this season, after a strong, and surprisingly sober, first half. He hasn't qualified ahead of Perez since Silverstone. Also, Renault had a stinker, never on the pace of even the midfield pack and finishing fifteenth and seventeenth, split by Kovalainen's Lotus. Nevertheless, Bruno Senna continued to impress after being the pace-setter of the two this weekend. Given Renault could face a four into two conundrum in filling their seats for 2012 now is a vital time to impress. But despite all of this, I suspect the incident from the 2011 Singapore Grand Prix that will get the most attention, certainly from the red-tops, will be that Lewis Hamilton again was involved in a clash with another car, especially as it resulted in some heated exchanges after the race. This time the clash was with Felipe Massa, wherein Lewis tagged the back of him just after trying to overtake. It ruined both of their races, as Lewis had to replace a damaged front wing (and got a drive through penalty) and Massa got a puncture, though Lewis's comeback drive to fifth was worthy. Whatever blame there was for the clash is Lewis's, but it struck me as a racing incident, something that happens when drivers try to pass each other, and not worthy of sanction from the stewards. The stewards do seem generally much more interventionist this year than last, and I wish they would return to the refreshing approach of 2010. I also heard a few comments to the effect of 'the stewards had to punish Lewis because Massa was impeded by his puncture', but surely that's irrelevant as sanctions should be about punishing bad driving and not equalising the outcomes of an incident? Those are just the way the cookie crumbles. Massa's frustration is perhaps understandable, given he's struggling for results generally, but I'd also suggest to him that starting personal grudges with fellow drivers, which is what he seems to be doing with Lewis, isn't usually the cleverest move. It also all provided further grist to the mill for those who suspect Lewis gets punished more readily than other drivers, especially as Michael Schumacher's clash with Perez, which seemed more careless than anything Lewis did, only received a reprimand. 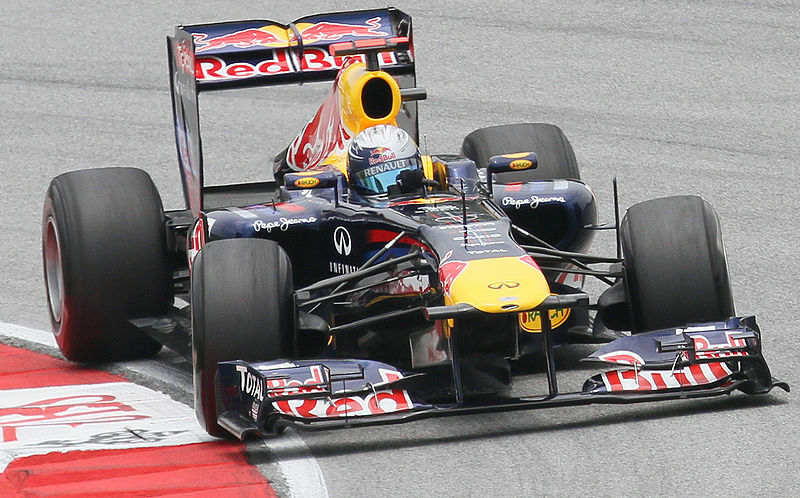 But once again the race was all about the imperious Sebastian Vettel - very nearly the 2011 drivers' world champion. Hi Graham, keep up the super blogs. I have to agree with you on your take of both Lewis' and Schumi's incidents. My heart is always in my mouth when I see any racing car become airborne. Whilst I am not convinced that DRS was directly responsible for either event I am strongly in the view that it should not be used for technical street circuits such as these where there should be more emphasis on good qualifying and skilful overtaking. As a viewer I was particularly disappointed by cars not participating in Q3 on Saturday and by some lacklustre defences of position during the race. All credit to Vettel though, he will be a worthy champion. Thanks very much for your comments Ant, and also for your compliments. I've had an open mind on DRS all season (and I agree that neither of the Lewis/Schumacher crashes had anything to do with DRS) but am beginning to wonder if a lot of the passing this year is coming from the variable performance of the tyres. In Singapore we still would have had many of the passes without DRS, both of Webber's passes on Alonso, both great to watch, had nothing to do with DRS, for example. Nice write up Graham and not a lot to disagree with.